Come join us — we’re one of the longest-running, city-park-based round robins in America — more than 35 years and still going strong every Saturday! It’s simple … just click through this photo tutorial and read the steps below. When you arrive, pay your fee, put your name on the board with three other players; when a court becomes available, go play one set, return to the check-in board and write your name to play again. Repeat this process as long as your mind, body and time will allow! Warm-ups during the first set of the morning are limited to a maximum of 10 minutes, as stated in USTA league rules, by which we abide. Play at your own pace. You can play once, twice or as many times as you can between the time your arrive and noon. Of course, the earlier you arrive, the more sets you can play. Come when you want. Leave when you want. The round robin is competitive, but it’s designed to be FUN. No pressure to wake up early. No pressure to stay and play. Above all, come have fun with us! Our round robin is like a United Nations of tennis, attracting players from all over the world who have come to Baton Rouge to study (LSU and Southern universities), work (Exxon, Dow, Shaw, etc.) or just live in a great tennis town! 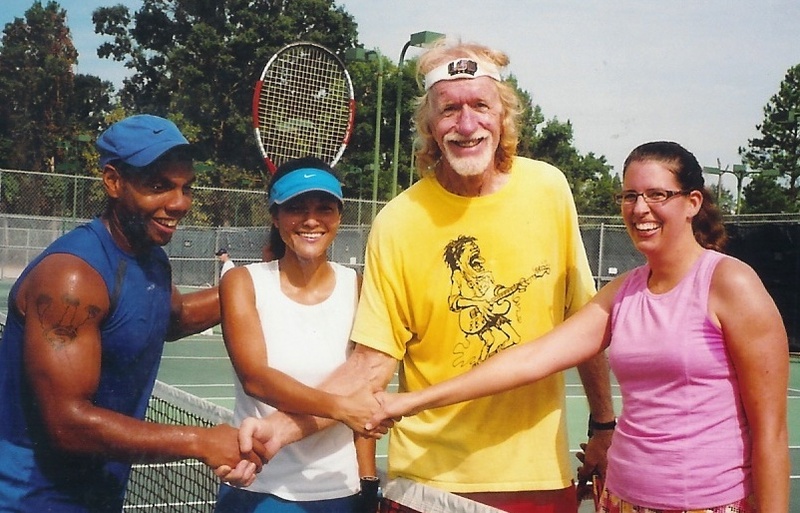 We have members who hail from several countries, and it’s not unusual to hear many different dialects and accents on the courts. Come join about 75 tennis lovers every Saturday for doubles fun, 8 a.m. until noon, at Highland Park (as noted below). HPTA members pay $5; guests pay $8; and first-time guests play free. We provide the courts, balls and snacks. We hope to see you at the following round robins. NOTE: During inclement weather, players are urged to call the Highland Park Tennis Center directly at (225) 766-0247 to inquire about court conditions, in case the HPTA is unable to get a cancellation notice out to the membership. Thank you for your cooperation and understanding. To contact HPTA, please fill out our contact form. To reach the Highland Park Tennis Center, call (225) 766-0247.